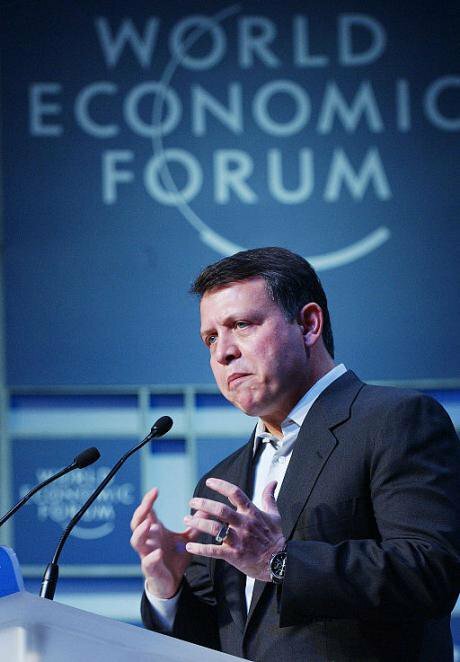 King Abdullah of Jordan, 2004. Wikicommons/Remi Stinger. Some rights reserved.The “Shia Crescent” has been a self-serving and self-fulfilling prophecy. Since its inception in 1979, never has the Islamic Republic of Iran had such influence and control over a range of state and non-state actors. In Iraq, Iran has unparalleled control over the Shia-dominated state and the country’s range of Shia militias currently fighting so-called Islamic State (IS). Elsewhere, Iranian influence over Hezbollah in Lebanon and Syria’s al-Assad regime has been reinforced since the outbreak of conflict in Syria and its transformation into a regionalised sectarian proxy war. Whilst for Iran it is mostly geostrategic interests that are at stake, for the others it is their survival. IS and its backers in Saudi Arabia and the Gulf have made clear their intent to reverse the Shia ascent in the region and eliminate the Shia community altogether. In other words, Iranian influence in the region has as much to do with the policies and reactions of the Arab world as it does Iran’s own maneuverings. Iran does not have influence over the region’s various Shia actors by default, but is helped by the way the Arab world regimes have historically treated Shia actors in the region. Traditionally, they have afforded little political and human rights to their Shia constituents. They have also treated their Shia communities as part of broader regional problems, particularly because of the religious and political ties that exist between the region’s different Shia communities. These ties do not necessarily mean that they are conducive to some form of pan-regional Shia alliance but, rather, that the Arab world has identified the region’s Shia communities as threats to their authority. Iran’s influence in the region today is nothing new. Under the Shah, Iran was also proactive, often embroiled in conflict or disputes with the Arab world and often supporting rebel or revolutionary forces, like the Kurds in Iraq. When Ayatollah Ruhollah Khomeini ousted the Shah regime and came to power, he called upon the Islamic world to rise up against their autocratic leaders. Whilst some Arab governments, like Syria, Libya and the Palestinian Liberation Organisation sent their congratulations to him, there was unease among the autocratic governments and monarchies of the broader region. Khomeini’s Iran permitted the notion that change and revolution was possible. The emergence of the Islamic Republic and the ousting of the Shah showed that the rule and power of despots in the region was not impregnable. Similarly, the over-arching and generally simplistic narrative emphasising the link between Shia actors in the region and Iran that we see today pre-dates not only the Syria conflict and the 2003 Iraq war but also the Islamic Republic of Iran itself. Arab world states have historically played on divisions and sensitivities toward Iranian influence; divisions between Arabs and Persians and divisions in Islam between Sunnis and Shias. Anti-government opposition figures, and Shia political movements more generally, have often, if not always, been charged with accusations of being Iranian agents. Under Saddam Hussein and his predecessors, the Iraqi state regularly accused its Shia community of being an Iranian fifth column. Like the 1979 Iranian revolution, the 2003 invasion of Iraq had an instant impact on the sectarian polarisation of the region. In perception, the empowerment of Iraq’s Shia community after 2003 was seen as the empowerment of the Arab world’s other marginalised Shia communities. In much the same way as the Iranian revolution had done in 1979 (although for both Shia and Sunni Arabs), the removal of the Baath regime and the fall of Saddam Hussein seemed to promise the deliverance of the Shia as a whole. The Shias’ dominance in the new Iraq also concerned the rest of the region because of the considerable extent to which they were organised and mobilised on the basis of their Shia identity. Arab world regimes have historically sought to project, through both coercive and non-coercive means, a vision and image of unity in their effort to legitimize their rule and contain internal dissent. Iraq after 2003, like the Iranian revolution in 1979, has undermined this projection. Further, Iraq’s Shia actors entered the new Iraq with extensive links to Iran, which gave Iraq’s Shia opposition groups, as well as Kurdish groups, extensive support in their effort to overthrow the Baath regime. The toppling of the Baath regime could have triggered the same sentiments, moreover, as the 1979 Iranian revolution, for the region as a whole, and indeed echo those sentiments triggered by the Arab Spring protests, among a population yearning for democratic and human rights. However, the toxic circumstances that followed the toppling of the Baath regime; the backdrop against which the war took place and the Arab world’s immediate mobilisation against the new Iraq, before it was given a chance to repair and rebuild, as well as the narrative that came from Sunni Arab actors in Iraq and beyond, ensured that the fall of Saddam Hussein was seen as the fall of the Sunnis and the rise of the Shia and Iran. When King Abdullah of Jordan referred to the dangers of a “Shia crescent” in December 2004, one stretching from Damascus to Tehran, passing through Baghdad, the definition of the Iraqi state was still unclear at the time and it was equally unclear whether Iraq would come to be ruled by a Shia alliance. Yet, Iraq’s neighbours in the Arab world had already decided to characterize the new Iraq as an Iranian client-state; its Shia parties, Iranian proxies. In other words, the post-2003 Iraq did not have to exacerbate sectarianism and polarise the region further along sectarian lines. But in response to this characterisation, a flood of jihadists used the Arab world states as a transit point to enter Iraq and wreak carnage, with the acquiescence of the governments of those states. Militants received active support from either Arab world governments or wealthy individuals from Saudi Arabia and the Gulf. As the trajectory of the post-2003 Iraq shows, it was in response to the Sunni mobilisation against the new Iraq that the Shias contested elections as a unified bloc, despite their ideological, political and social divisions. This came in 2005, when Grand Ayatollah Sistani brought Iraq’s Shia parties and movements together in order to ensure that a resilient Sunni insurgency, backed by the Arab world, did not take them back under Baathist or Sunni Arab dictatorial rule, which cross-sections of Iraq’s Shia community feared at the time. As one Iraqi Shia noted to me in 2007: “I would much rather live in a jungle than a Baathist prison”, referring to the chaos and the civil war that had engulfed the country at the time. Shunned by the Arab world, Iraq’s Shia-dominated state was effectively pushed into Iran’s orbit of influence after 2003. More recently, Iran was the only outside power that deployed advisors and special-forces in the country in June 2014, when IS took control of Mosul. While the west dithered as Iraq’s capital, Baghdad, was being targeted by IS, Iran responded almost immediately to a threat that threatened the Iraqi state and the Shia community itself. Iranian support has manifested itself in the form of arms and funds; organisational and technical assistance. That, inevitably, translates into some form of influence and control. The post-2003 Sunni Arab rejection of the new Iraq; followed by the sectarian proxy war in Syria and the anti-Shia basis on which IS functions and on which the Arab world states legitimise and strengthen their rule, has created a unifying thread that mobilises and unites the Shia, despite their own internal divisions. In other words, any Shia dependence on Iran, whether this occurs in Iraq, or Syria – where the Shia Allawite sect is traditionally seen as heretic by most Shias – or in Yemen – where the Houthis belong to a sect of Shia Islam (Zaydism) that is in fact closer to Sunni Islam – is not necessarily a matter of choice or of default, but one of necessity. This has proved pivotal in bridging the divide that has existed between different sections of the Shia community both within Iraq and in the region. It has also transformed the Shia identity into a powerful galvanising force, particularly since the rise of IS and the outbreak of conflict in Syria. Shias throughout the region retain a strong sense of their national identity and seldom will you meet a Shia that rejects his or her national identity. But what recent conflict in Syria, the rise of IS and the anti-Shia sectarian narrative from the Arab world has done is to coalesce the region’s Shia community around the Shia identity, despite their political, social and ideological differences. In other words, the notion of a Shia Crescent might be a greater reality today than it was before when first asserted by King Abdullah in 2004. But it has been both a self-serving and a self-fulfilling prophecy.